PST File Compact Utility is simplified tool to compress all the PST Files in a trouble-free way. 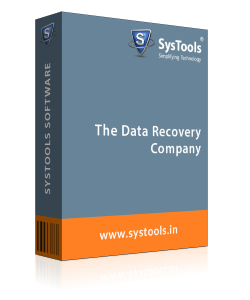 It is having many essential features that ensure the compaction of PST files in a proper way without any modification in the data. 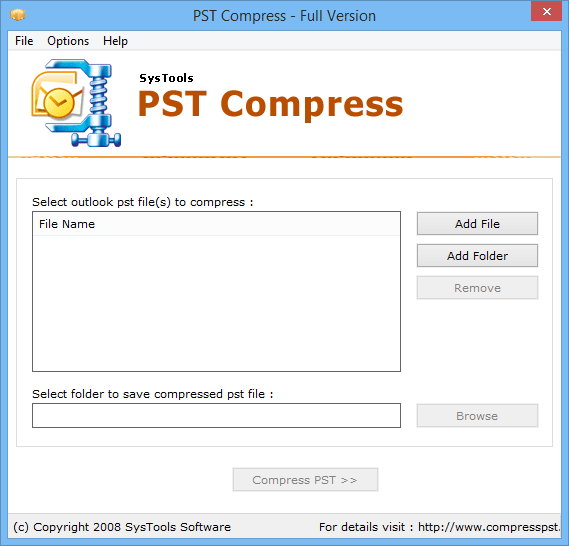 Compact Large PST files This software provides a facility to compress large PST files in a trouble freeway. A large ANSI PST file, which is about to touch 2GB size, may leads to corruption of such file. Therefore, with this tool, a user can reduce size and thus, manage Outlook files easily. 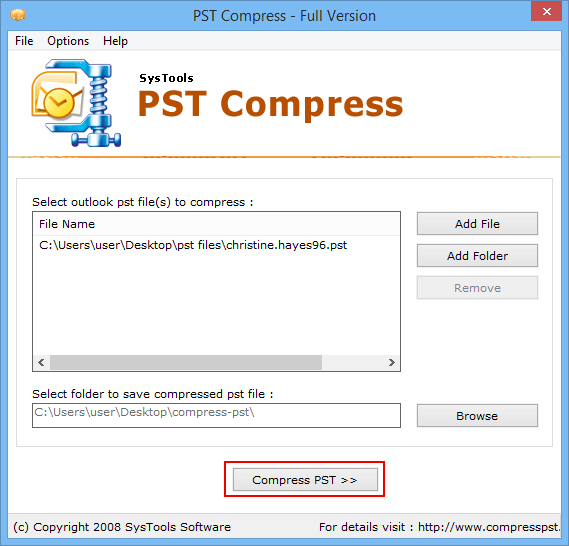 The PST File Compact Utility comes up with multiple options to compress Outlook PST file. Users can remove, extract, and save attachments to reduce size of PST files. This software provides facility to compress the attachments, as per the requirement and make it easy for users in tackling with Outlook files of large size. Users can compress PST files without deleting attachments because this product gives an option to extract attachments, which is there in Outlook PST file and save them on local machine. With help of this feature, one can reduce PST file size just by removing attachments from emails of source PST files. 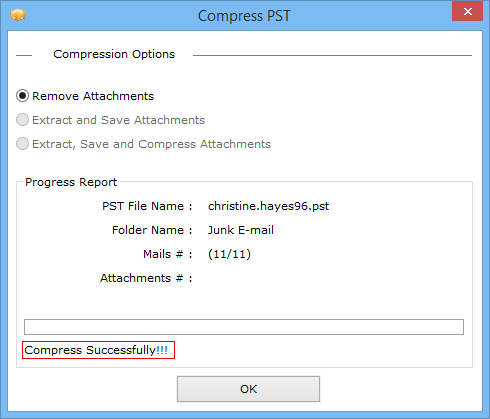 PST Compress utility renders an another option to compress Outlook data file i.e., Eliminate PST attachments. This options permanently removes email attachments of a PST file, which are no longer saved either on local machine or anywhere else. As a result, this step will shrink the PST size and eliminate the attachments from source PST files. This is the last option provided by Outlook compression tool, which reduce file size by first extracting attachments and then compressing them in ZIP file format. It means that attachments are removed from PST file and saved in ZIP format on local machine. In such cases, both the PST file and attachment files both will be in compact form. PST File Compact Utility creates a complete progress report, which makes easy for users to analyze compression procedure for future usage. This confirmation report includes each and every information, which includes name of the PST file, name of the folder, total number of mails, and reported attachments, as well. Q. Is there any file size limitation? Ans: No, there is no file size limitation for compression with help of this utility. You can compress PST file of any size. Q. Does this software compress the files in batch? Ans: Yes, PST Compact Utility is designed in such a way that it can compress multiple PST files at once that helps you to save your crucial time. Q. 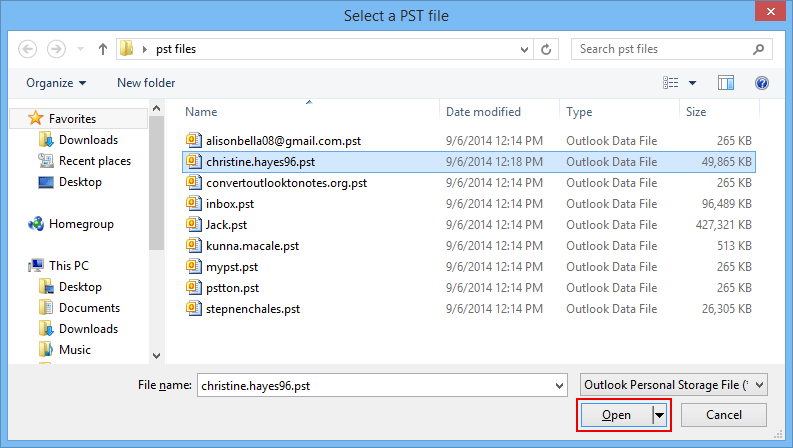 Does Outlook PST Compact Utility support PST file of Microsoft Outlook 2013 version? Ans: Yes, this software supports Microsoft Outlook version 2013 and below that. So, you can easily compress all the PST files. Step 3 : Select and Open the PST file(s) that you want to Compress. Step 4 : Note - If you want to delete selected PST files from the files list, then click on the Remove button to delete the file from list. Step 5 : Now, choose the folder to store the compressed PST files. Click on the Browse option to choose the folder & save compressed PST file. And Click on OK button. Step 7 : Select any suitable option to compress PST file. Remove Attachments:- This option helps users to compress PST files. This option will remove / delete all the attachments while storing the compressed PST files. Extract & Save Attachments:- The option extract the attachments and that will be stored in another folder. Extract, Save & Compress Attachments:- With this option, we can extract the attachments and that will be saved in separate folder in zipped format (.zip file). 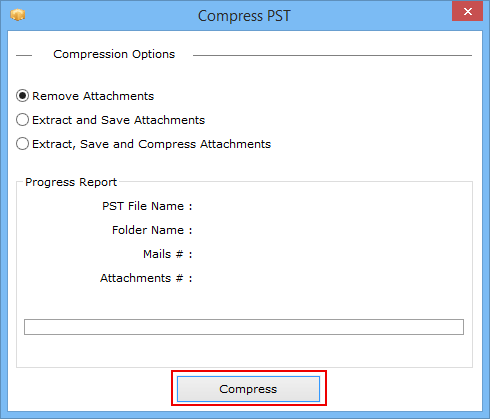 Step 8 : Now click the Compress to start the compressing process of PST files. Step 10 : After compressing process, the compression software will show the status of completely compressed PST file. Step 11 : Next, to see the Compressed PST; go to the distinctive folder. You will surely be able to see the Compressed PST file. I have used PST Compact Utility for the first time to reduce size of PST files. I am very happy with this software. The best part of this software is that it compresses both the file types, i.e., ANSI and UNICODE PST files. “Thank you so much for this PST Compact Utility. It resolves my problem of compressing PST files. 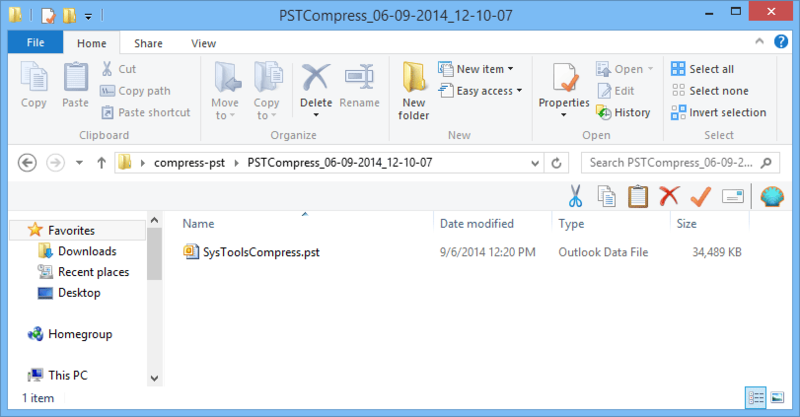 Now, I used PST Compact Utility every time whenever I want to compress any of my Outlook PST file. This is really an expert solution and makes the work of compression very smooth and easy.